A PC based touchscreen EPOS system designed for retail applications but so flexible it is equally at home with hospitality applications. Independent research shows that touch screen technology can increase your customer flow by up to 30% because of its ease of use and speed of transaction. The UP5300 is a touch screen EPOS system that is so flexible it can be used for Retail applications and Hospitality applications. Being so flexible it can offer all the advantages of EPOS as a stand-alone machine and as part of a network. As a PC based touch screen enabled EPOS system the UP-5300 links to an impressive choice of peripherals  including printers, scanners and weighing scales for retail applications as well as hand held terminals for hospitality applications. Using Sharps own software for either retail or hospitality, the UP-5300 can offer you the total solution you need to comprehensively manage your business. 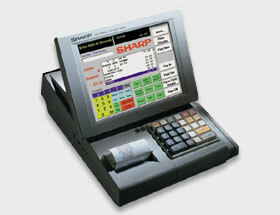 Touch screens provide simple, error free communication during the order process. Training is made simple, for managers as well as new staff. Greater adaptability, with precisely tailored controls. Reduced administration as colour touch screens enable easy product grouping. Graphical user interface designed for ease of use, speed of operation and minimal training overheads. Product scanning and keyboard entry. Hot keys (i.e. lottery/bread/milk/grocery items). Centralised management - products, menus and keyboard layouts can be sent centrally for automatic next day action by system software. Future proof flexibility with powerful menu list ensuring the operator always makes the correct choices.